Enes Kanter scores 20 points ands grabs 18 rebounds in Sunday's impressive Game 1 victory vs. OKC. The NBA TV analysts discuss Portland's win over Oklahoma City. Appeared in 373 games (114 starts) and averaged 10.7 points and 6.7 rebounds in 21.3 minutes. 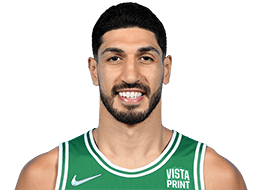 Appeared in 82 games (one start) and averaged 12.7 points on .576 shooting from the field (414- of-719 FG, 4th in the NBA) and 8.1 rebounds in 21.0 minutes. Only Thunder player to appear in all 82 games which represented the first time he had accomplished the feat in his career. Careerhigh PER of 24.1 (10th in the NBA and highest amongst bench players). He was the only player in the NBA to average 12-plus points and eightplus rebounds off the bench. His 8.1 rebounds per game represented the highest amongst bench players. Established new career-highs in points (1038) and rebounds (664). Led all reserves with 25 double-doubles. Recorded career-high 33 points while pulling down 20 rebounds at Portland (4/6), becoming the first Thunder player to put together a 30-20 game in the Oklahoma City era. Scored 26 points in 22 minutes vs. Portland (3/14). Shot 11-of-11 from the field for 23 points at Sacramento (2/29). Notched 25 points on 10-of-14 shooting at Denver (1/19). Back-to-back games of 20-plus points on 12/27- 12/29. Produced 24 points and 13 rebounds vs. New Orleans (11/18). Opened the season with 15 points and 16 rebounds vs. San Antonio (10/28). One game of 30-plus points. 11 games of 20-plus points. Scored in double figures in 57 games. 27 games of double-digit rebounds. Led team in scoring twice and rebounding 21 times. 2014-15: In his Thunder debut, recorded 10 points and 13 rebounds at Charlotte (2/21) followed by 20 points and 12 boards vs. Denver (2/22) the next night. Posted 23 points and 15 boards vs. Minnesota (3/13). Totaled 18 points and 18 boards in a win vs. Chicago (3/15). Scored 27 points on a career-high-tying 12 field goals with 12 rebounds vs. Miami (3/22). Totaled a career-high 30 points (9-of-13 shooting) with 16 rebounds vs. Dallas (4/1). Notched 25 points and 16 rebounds in a win over LA Lakers (3/24). Scored 27 points to go with 13 rebounds in a win over Portland (4/13). Registered 25 points and 15 boards in the Thunder’s season finale at Minnesota (4/15). Acquired by Oklahoma City from the Utah Jazz through trade on 2/19. Scored a then career-high 29 points at New Orleans (12/16). Put together a double-double of 23 points and 16 rebounds at Milwaukee (1/22). Had a team-high 21 points and 11 rebounds vs. LA Clippers (1/28). Scored in double figures in 58 games. Scored 20-plus points on 18 occasions. Has recorded 30 double-doubles this season (16 with the Thunder). Grabbed 10-plus rebounds in 30 games. One game DNP – Right Thigh Contusion. One game DNP – Left Ankle Sprain. 2013-14: Appeared in 80 games (37 starts) and averaged 12.3 points and 7.5 rebounds in 26.7 minutes, all career-high marks. Posted a careerhigh 24 double-doubles. Led Utah in rebounding 24 times and in scoring 11 times. Recorded 10 or more points in 53 games and 20-plus points in 12 games. Pulled down 10 or more rebounds in 27 contests. Recorded a then career-high 27 points and 14 rebounds at Milwaukee (3/3). Pulled down a career-high tying 10 offensive rebounds (12 total rebounds), while contributing 20 points at Phoenix (11/1). Missed one game due to right quadriceps tendinitis. Inactive one other game. 2012-13: Appeared in 70 games (two starts) and averaged 7.2 points and 4.3 rebounds in 15.4 minutes. Scored in double-figures 22 times. Grabbed 10-plus rebounds twice. Had two double-doubles. Registered a then careerhigh 23 points and career-high 22 rebounds vs. Charlotte (3/1). Missed two games due to a sprained right ankle. Missed 10 games due to a dislocated left shoulder. 2011-12: Appeared in 66 games and averaged 4.6 points and 4.2 rebounds in 13.2 minutes. Became the 10th Jazz rookie in franchise history to appear in every regular season game. Scored in double figures seven times. Pulled down 10-plus rebounds four times. Had 11 rebounds at LA Lakers (12/27), the most in a Jazz rookie debut since the team moved to Utah. In 22 games averaged 8.4 points and 5.8 rebounds in 16.6 minutes. 2012: With Utah, appeared in four games against San Antonio, averaging 3.5 points, 4.0 rebounds and 1.00 block in 10.8 minutes. Played for the Turkish national team at EuroBasket 2011 in Lithuania, averaging 9.6 points and 3.9 rebounds. Played for the Turkish U18 national team in 2009 and was named the championship’s MVP after averaging 18.6 points and a tournament-best 16.4 rebounds, leading Turkey to the bronze medal at the European Championships in France. Named Best Player and Best Center at the 2009 European Championships by eurobasket.com. Won a bronze medal at the European Championships in the U16 division in 2008. Shot an event record 13- 21 from the field, scoring 34 points and grabbing 13 rebounds at the 2010 Nike Hoops Summit in Portland, Ore.. His 34-point scoring effort for the World Team broke the individual record of 33 points previously set by Dirk Nowitzki in 1998. Enrolled as freshman at the University of Kentucky in 2010-11, but ruled ineligible to play by the NCAA. Though unable to compete, stayed at Kentucky as a special assistant, attending classes and working out with the team.